There are two sets of blinds, one for the 1950's and 60's era, the other for the 70's onwards. They are approximately twice full size for OO/EM (4mm to 1 foot scale). Almost every possible destination is included, and they've been organised into geographical groups. Save the GIF file and convert it to a bitmap format. Load it into a suitable Art package, size it as necessary, and print it out. Cut out the destination required and fit it to your DMU or EMU. British Railways Electrification Warning signs. You'll need to have a colour printer to use these. Just save the two GIF images above. Convert and load them into an art package and scale them so that each prints out at 8mm x 13.5mm for 4mm scale (or equivalent). Cut out one of each and stick them back to back, then fix them to a post. These signs are sited at the approach to electrified areas. You can see one to the right of the loco in the picture below. This ZIP archive contains EPS, SVG, and PDF vector graphics files comprising seven pre-1965 British Railways totems, in the six regional colours plus one in black and white. These will need to be resized and the text altered if you wish to use them to make station signs. If you find these graphics useful please let me know. 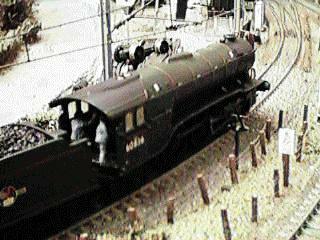 Close up of LNER V2 No 60836 'under the wires'. Electric Soup © I.W.Logan MCIT 1998-2006. Last updated: 03 Sep 2006 at 16400BST.